"Instruction" is not always "nectar;" especially when it includes pointed suggestions on how we should improve our character. It's easier on the ego to learn ballroom dancing or how to improve our golf swing. But for the rare person looking to make progress in spiritual understanding, Nectar of Instruction is one of the most important guides available, as essential to the spiritual path as guardrails and yellow lines are to any driver. 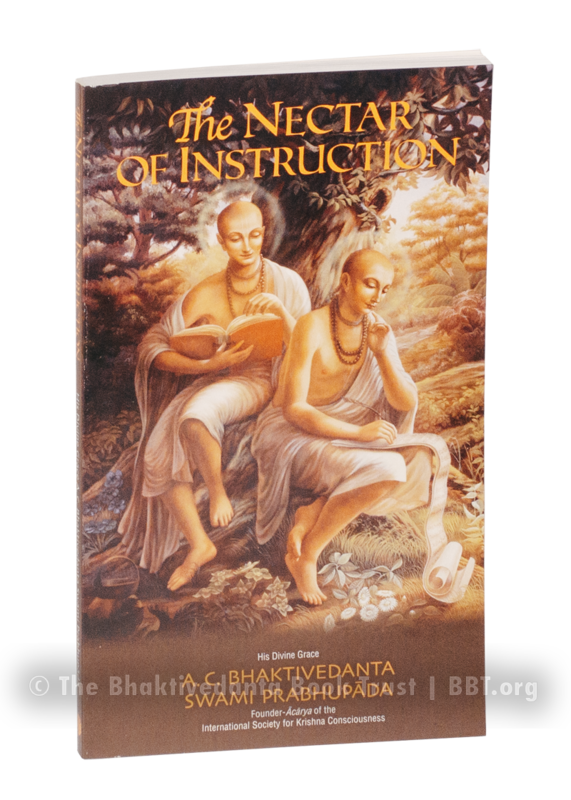 Nectar of Instruction is a translation and commentary on Rupa Goswami's Upadeshamrita; eleven verses on the most basic and essential principles of spiritual practice; how should an aspiring transcendentalist interact with the rest of society? What should be his work ethic? Whose company should he seek, and whose company should he avoid? Where should he live? How can one know if he's making any spiritual progress at all? What, really, is the ultimate goal of life? "The Nectar of Instruction has come out very nice. It is very important and must be immediately read by all devotees. In the near future we shall introduce the Bhakti-sastri examination for second initiation and this shall be one of the required books of study. Anyone who reads it will immediately understand what Krishna Consciousness is. Some minister in Bombay recently asked me how to create morality amongst the students, because the students are all vagabonds. If this book is introduced for study in the schools and colleges it will give a clear idea of what morality actually is. It is a most important book." Contains the original Sanskrit text, roman transliterations, synonyms, translations, and elaborate purports.